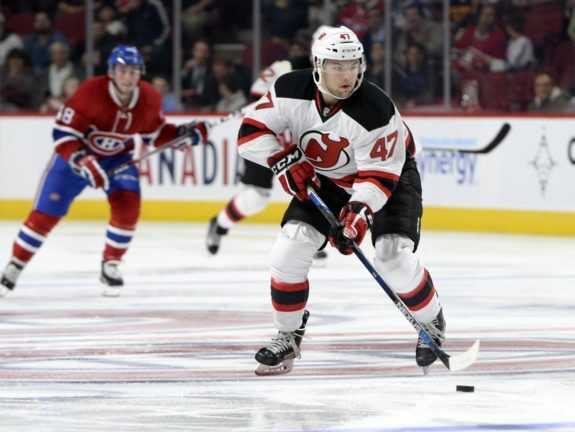 The New Jersey Devils have closed the NHL portion of their preseason schedule, with their finale coming against SC Bern of Switzerland. They’ll now turn their attention to getting ready for the regular season, which begins this Saturday. 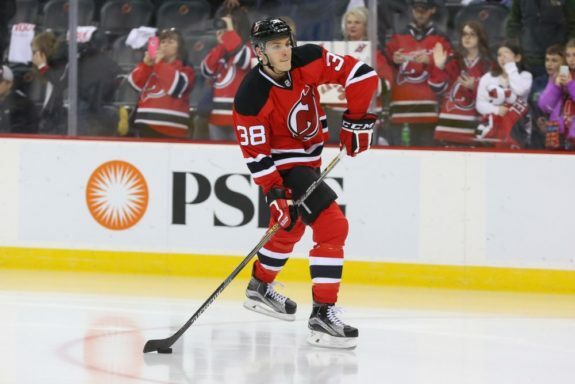 The Devils had a few notable performances during the preseason. Which players seem to determined to get off on the right foot when meaningful games begin? Despite his late-season struggles, Bratt had a productive rookie season in 2017-18. He finished with 13 goals and 35 points, which was third on the team for a rookie. 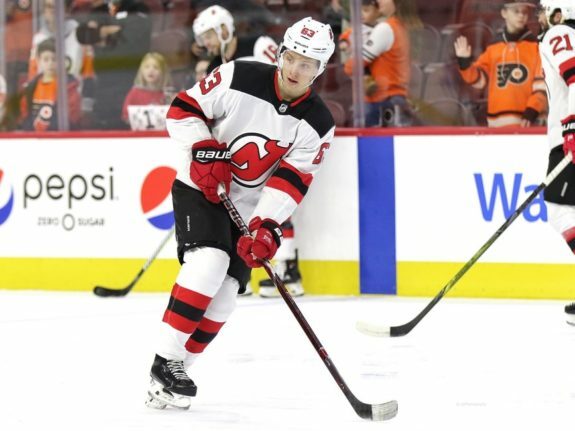 He played top-line minutes with Nico Hischier and Taylor Hall and helped the Devils get off to a hot start. Bratt may not play on the top line to start 2018-19. But he will be expected to play an important part once again. During the preseason, he’s shown that he’s ready to handle a scoring role. At five-on-five, the Devils had a 50% Corsi For (CF%) and out-chanced their opponents 12-11 with him on the ice. One area Bratt struggled with last season was shot generation. He wants to shoot more, and so far, it hasn’t been an issue for him. He has nine individual shot attempts, as well as five scoring chances. That’s an increase from last preseason, where he had four shot attempts and three scoring chances. Bratt is a good bet to start on the second line with Marcus Johansson and Pavel Zacha, so the Devils will need him to score. If he keeps shooting the puck, it will help him avoid the kind of slump he endured during the second half of last season. It’ll also give the Devils the scoring they need behind their first line. He may not get the same attention as Hall or Hischier. But Palmieri has been one of the Devils most consistent players over the last three seasons. He’s scored 24 goals or more in each season and has produced at a 56-point pace per 82 games. During this preseason, he’s been firing the puck at a torrid rate. In all situations, he has 16 individual shot attempts — which leads the team — along with six scoring chances and three high-danger chances. He also leads the team with two goals and five points. What’s impressive about Palmieri is his production at five-on-five. 11 of his 16 shot attempts have come at that strength, as well as five of his scoring chances. Palmieri has always been a threat to score on the power play. But if he puts up these kinds of numbers at five-on-five in the regular season, the Devils will have the potential to have a dominant first line with him, Hall, and Hischier. After his fourth training camp with the team, Quenneville has seemingly cracked the Devils’ opening night roster for the first time. He has a goal and an assist, as well as seven shots on goal, the latter of which is tied for second on the team. At five-on-five, Quenneville has performed well. The Devils have a 53.75 CF% and have out-chanced opponents 16-14 — including an 8-4 advantage in high-danger chances — with him on the ice. Those were among some of the best numbers of any Devils prospect at camp. Quenneville got power play time during the preseason and figures to when the regular season begins. He had a goal, four shots on goal and six shot attempts while up a man. Quenneville won’t be playing on a top scoring line, at least right away, so any offense he can add with the man advantage will be beneficial. It was a crucial preseason for the 22-year-old, who has been knocking on the door of an NHL spot for a while. When he needed to most, Quenneville answered the bell. He showed noticeable improvement in his two-way game and looked much quicker than in previous preseasons. If his performance was any indication, he should be of help to the Devils. Steven Santini Heading in the Right Direction? The Devils seem to have their defense pairs set for opening night. While that may be the case, Santini shouldn’t be forgotten. It is a small sample size (just 22 minutes), but he did have the best underlying numbers on the Devils during the preseason. They had a 72 CF% and out-chanced their opponents 9-2 with Santini on the ice in two games. That’s a far cry from last season, where he had some of the worst underlying numbers in the NHL. His preseason numbers aren’t sustainable in the long term. But if he continues to have a positive impact, he’ll eventually get playing time. That playing time may come sooner than later, too. Players go through slumps and injuries happen, which could open the door for him. Whatever the case may be, he seems to be a better defenseman than he was at this time last year. That should help give the Devils another option on their blue line.